An unusual and attractive climber. Produces numerous stems, all clothed with flowers during the summer. The blooms emerge red and change progressively through orange and yellow to white. HHA - Half hardy annual. 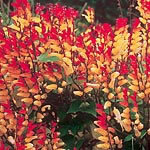 See photos of Ipomoea lobata in real gardens.